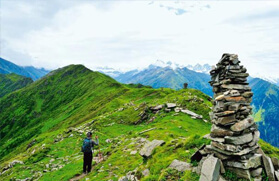 An intriguing trek in Dhauladhar, Mountain of Lakes Trek is a challenging trail offering trekkers a real sense of adrenaline rush. Chamba Mountain is an immense landform stretching above the surrounding land in the limited region usually in the form of a summit. The region has a peculiar topography that is extremely rocky and has lots of granite as well. The crest of Dhauladhar is carpeted with a huge expanse of snow. 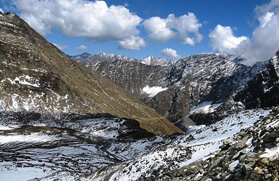 The trek starts from the intriguing region of Bharmour. The panorama offers the trekkers to visit the unscathed areas, especially high altitude lakes that have mythological background. 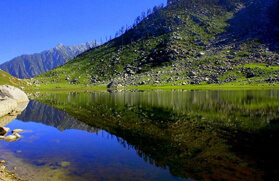 These radiant lakes are believed to be the abode of Lord Shiva. 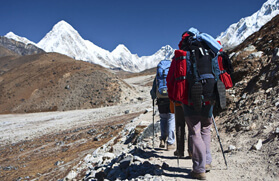 This 12 Nights and 13 days itinerary takes the traveller to an enchanting trekking tour to mountain of lakes. Major destinations coming en route are Bharmour, Samra, Kali Dal, Lam Dal, Naag Dal, etc. The landscapes from any of the passes of the Dhauladhar towards Pir Panjal and the Greater Himalayas are most fascinating and stunning allowing an unhindered view of the mountain ranges and deep valleys with their distant, snow-laden, dome-like captivating peaks. The backdrops rendered by the trail evoke a pleasant and exciting feel in the wits of adventure aficionados. Take a night train for Pathankot from Delhi train station. Overnight train journey. On arrival at Pathankot train station meet our executive and transfer to Dalhousie by road which will take 3-4 hrs. On reaching Dalhousie check into the hotel and in evening visit local sight seen of Small Hill station Dalhousie. Overnight stay at hotel. After breakfast at the hotel, we will move from Dalhousie to the Kalatop wildlife sanctuary and then to Khajiyar. Enjoy the beauty of Mini Switzerland and take lunch. After Lunch, we will move to Bharmour via Chamba. On arrival in Bharmour, check into the hotel. In the evening, we will join the Aarti at Chaurasi temples. Later, return back to the hotel for an overnight stay. 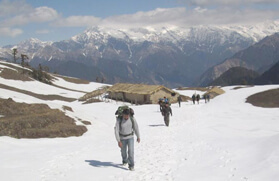 Today, we will leave early in the morning after breakfast with packed lunch for trekking to Bharmani Temple, which is situated on the ridge and is a 03 km trek from Bharmour. In the evening, return back to the hotel in Bharmour for an overnight stay. In the morning after breakfast, we will move to a small village Chatrari through taxi to cover a distance of about 38 km. Chatrari is a small and a beautiful valley village famous for the ancient Shakti temple. Enjoy the village and visit the famous temple. Thereafter, ahead toward Samra. After reaching at Samra village, we will visit a Naag temple. 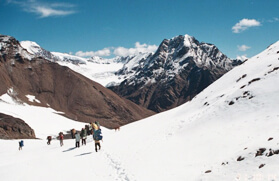 Spend the rest of the day for acclimatization and an overnight stay in the camp. Today we will leave from Samra to reach Budhau Naag and thereafter to the Base Camp, which is a 12 Kms run and is quite interested as road head ends at Samra village. From here, we will go straight for 2 Km through dense forest and will cross a small bridge over nallah then climb for 2 km and will reach at small destination Budhau Naag. There is a small shrine dedicated to Lord Naag. 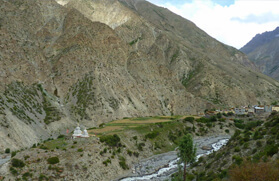 Stay while at Budhau Nag then move ahead to Base Camp just four kms along with nallah. After reaching the base camp, get rest for the next day journey. Enjoy dinner followed by an overnight stay in the camp. 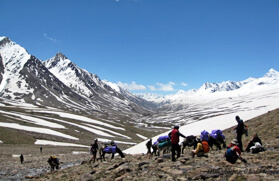 We will leave early in the morning after breakfast today with packed lunch and move from Base camp for an adventurous trek to Kali Dal. 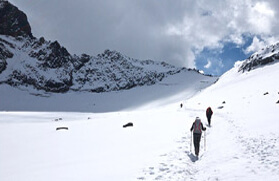 A climb of 2 km will reach a glacial lake know as Kali Dal. We will take some rest at Kali Dal and glimpse the beauty of the Lake and surrounding. After taking Lunch at the lake, we will trek to Lam Dal. 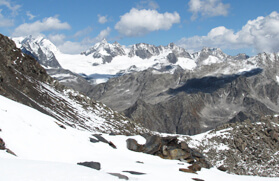 The trail upwards west crosses precipitous rock faces and through boulders will reach Lam Dal. Lam Dal is another biggest lake in the range. The devotees take a dip in this lake during the month of July. The run of 4 -5 Hrs from Kali Dal will reach Lam Dal. After reaching Lake establish the camp and take a holy dip in the lake. An overnight stay in the camp. In the morning after breakfast with packed lunch, we will trek to Chander koop lake a run of 2 hrs will reach the lake. Chander Koop (Moon Lake) 4100 meters is a beautiful lake with ice blocks floating in it. Thus, it is also known as an Ice Berg lake. Take lunch and spend 2 hrs at the Lake. Later, return back to the base camp at Lam Dal for an overnight stay. Today, we will trek forward to Naag Dal. Nag Chatri Dal (King Cobra Lake} near the lndrahara pass. It is related to the Bhagsu Nag waters and is situated on the other side of the Dhauladhar at an elevation of 4200 meters. The devotees take a dip in this lake during the Manimahesh Yatra towards the end of August and early September. The trek of 5-6 hrs through boulders will reach at Naag Dal. Take a holy dip in the lake and spend some time a then move downhill to Chatta Goth. 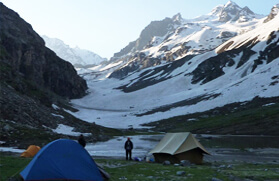 After reaching Chatta, establish the camp to enjoy dinner and an overnight stay. After breakfast in the morning, we will move to a small village Kuarsi. A run of 4-5 hrs will reach at Kuarsi village. Spend the rest of the day in the village and visit another temple of Naag known as Kuarsi Naag. An overnight stay in the camp. After spending a week in the Dhauladhar range and a circuit trek through glacial lakes, we will return back to Bharmour today. After a run of two hrs from Kuarsi, will reach another small village Lamu. Take the taxi from Lamu and reach Bharmour. On reaching Bharmour, check in to the hotel for an overnight stay. In the morning after breakfast, the departure of the group will be done from Bharmour. We will move to Chamba and take lunch here. Also, we will visit here Laxmi Narayan Temple and Bhuri Singh Museum. Thereafter, we will move further to Pathankot and from here catch night train for Delhi. Overnight train journey. Arrival at Delhi by morning.